Today I’m going to talk about Ōkamiden: Chiisaki Taiyou 大神伝〜小さき太陽〜 for the NDS. While not exactly a preview, as I’ve played a substantial amount of the Japanese version which my mom so kindly picked up for me when she was in Japan, since the game won’t be out in English until March 31st in AU (March 15th for US residents), I’ll just stick to some spoiler-free general impressions for now. Okamiden is a sequel to the stellar action-adventure PS2 game Okami, which was later ported to the Wii. Okami was hailed by fans and critics for it’s artistic cell-shaded graphics and innovative controls, which had players using the god Amaterasu (in wolf form)’s “celestial brush” to preform actions. The game, however, was a commercial flop worldwide, but maintains a cult status today. Having played Okami when it was first released in 2006, I was pleasantly surprised to hear there would be a sequel for the DS coming out towards the end of 2010 in Japan. 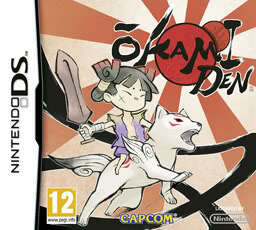 With the original studio behind the game now gone, however, is it possible for Okamiden to live up to its predecessor? Fans of Okami will be more than pleased, I believe, to play Okamiden on the DS, which makes drawing with the celestial brush to execute commands very intuitive. The graphics are in the same style as Okami, and most of the areas are taken almost directly from the old game, with a few simplifications to make them work for the DS. Some might find this tedious, but so far I have enjoyed having a nostalgic romp through the world of Okami once again. Those new to the series, however, might be alienated from the game. I would be very interested to see how newcomers find it, and whether or not they feel their enjoyment of the game was hindered by their not having played the original (there is a recap sequence at the beginning of the game to get everyone to the same place story-wise). While Okamiden has everything I loved about Okami, playing it on the small DS screen with limited graphics makes me wish the developers had gone the extra mile to make a luscious HD PS3 version instead. Think of the potential! The rail camera can also very frustrating at times, but I believe it was a necessity due to the game being for the DS. 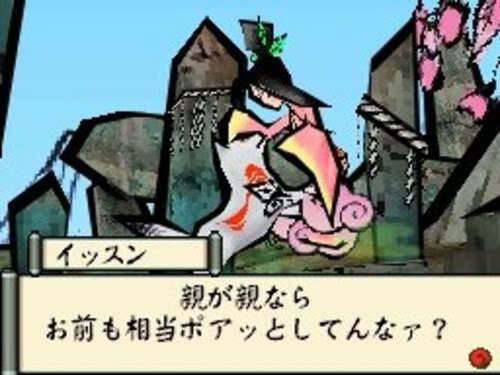 The one major change for Okamiden has been the addition of a second character, who you control to solve puzzles with Chibiterasu (or mini-Amaterasu, the protagonist of the game). This makes for some different puzzles then the first game, and I was surprised to find that there is more than one character who teams up with Okami during the course of the game, and it is all incorporated into the storyline. I don’t want to give any plot spoilers, but I was surprised and delighted to see how the gameplay changed slightly with the different characters. The story so far has been fun, and is filled with old and new characters to keep things interesting. The constant references to Japanese culture in the enemies, gods, and the story itself (which was adapted from the Kojiki) really make the game a unique experience, and should thrill anyone who is interested in Japan. I can’t say anything more about the story right now, but I will give a follow-up with overall impressions when I finish the game! All in all, I’d say Okamiden is a must for any fans of Okami. It’s probably one of the best-implemented action adventure games for the DS, so even non-fans should check it out (and look into playing Okami, as well!). Unfortunately, just as Okami came out at the end of the PS2’s life and was inevitably overshadowed by PS3 hype, Okamiden’s English release will coincide with the release of the 3DS in March. Here’s hoping it gets the attention it deserves.